Starting a Singing Career? 4 important ideas to consider! Interested in starting a Singing Career? 4 important things to consider! Do I have a burning desire to sing? Am I willing and able to practice and study for several (or many) years before I have any real public success? Am I the sort of person who can keep working on my own even if it takes a long time for me to accomplish my dream? Am I able to envision my success and keep that vision in mind over time? All of these qualities are important to a person who is interested in starting a singing career. Have you informed yourself about what it takes to become a successful singer? Informing yourself must go beyond simply watching the “How to Become a Star!” type of TV shows. Let your desire take you beyond that limited vision of a singer’s life. For example – take a look at the courses required to get a university degree in singing (jazz or pop) these days. Singers have to learn a lot about music to be able to read and write songs. And if you want to be able to speak the language of music with instrumentalists, you must learn how to read music easily and well. It is also very helpful to know how to arrange music for your back-up musicians or, at the very least, you must know how to write a vocal “chart” of your songs. Case Study: One 20 year-old told his mom how much he wanted a career as a musician. He said he would do anything to make it happen. But after he spent a year at college learning how to play piano and read music, he said he had no idea how much study it took to do music well. He changed his mind about becoming a musician and went in another direction. 3. HOW MUCH NATURAL TALENT DO YOU HAVE? Talent: a power of mind or body considered as given to a person for use and improvement. It takes a wide variety of talents to become a good singer. Some of these go beyond the “natural” physical talents that we associate with singing. But for now, I want to focus on 4 primary talents. Your Voice – Do you have a voice that sings easily? Do people like to hear your voice? Do you like the sound of your own voice? Do you feel good when you sing? Do people ask you to sing? Your Ear - Can you sing in tune? Do you have a feel for rhythm in songs? Can you remember and sing melodies easily? You do not have to answer “yes” to all of these questions in order to move ahead in singing. But it is good to have support for your singing both inside yourself and from friends and family. There are likely many singers who have started with very little obvious vocal talent who have done well in the professional world of singing. But no doubt they had other strong talents that gave their voice wings. Imagination & creativity – Can you imagine your success as a singer? Can you imagine how you might feel when your voice works well – when you can sing easily and from the heart? Can you see yourself creating songs of your own? Ability to get along with others - Are you able to work easily and well with others? So if you are serious about starting a singing career, work on your social skills. 4. HOW MUCH SUPPORT DO YOU HAVE? Support for a career is a little discussed value in a striving singer’s life. But it is vitally important. If you have family members and/or friends who encourage your journey into the arts world, you will be able to rest on their energy at times when you feel exhausted or hopeless. And those days do come around. Having a life in the arts is a great priveledge and a great challenge. Every artist needs emotional support. If you have even one person who can be counted on to "be there" for you, this connection to positive energy will make a huge difference in your life. When you find that kind of support – treasure it, see it as a great gift and repay it as you are able. 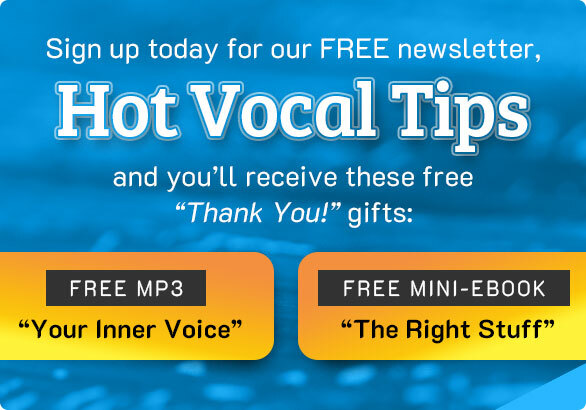 These are just a few ideas for you to consider as you begin your journey into singing. Most of us in the arts world need to continue to work on self esteem as we polish and perfect our artistic talents. Look here for some helpful ideas on boosting your self esteem.